The Virginia Institute of Marine Science recently welcomed the fifth group of interns to its six-month Oyster Aquaculture Training Program (OAT) to learn the skills needed to enter Chesapeake Bay’s rapidly growing oyster-farming industry. The program—funded by an anonymous donation to the VIMS Foundation—was established by VIMS’ Aquaculture Genetics & Breeding Technology Center (ABC) to help meet the demand for trained staff in industry, and to aid in the Institute’s own oyster-domestication programs. The interns will work throughout the oyster hatchery season—which runs from April to September—learning about all the stages of oyster aquaculture by rotating through hatchery, nursery, and farm grow-out activities. A native of Williamsburg, Franks heard about the OAT program while volunteering for an oyster restoration project with the Chesapeake Bay Foundation. Armed with a degree in Biology from Virginia Tech, Franks applied to the program because of her passion for Chesapeake Bay and her love of seafood. “I’m a big supporter of oyster aquaculture being a sustainable way to produce oysters to be enjoyed as food,” says Franks. 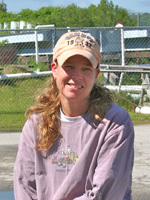 Grover hails from Lisbon Falls, Maine, where she developed a life-long love of the ocean. A graduate of the University of Colorado with degrees in geography and environmental studies, Grover says she was first introduced to oyster aquaculture during one of VIMS’ annual Marine Science Day events a couple of years ago. Hanson comes to VIMS with an Associate of Applied Science degree in Aquaculture Technology and an Associate of Science degree in Biology Education from Carteret Community College. 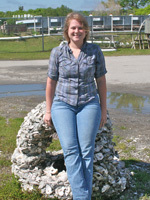 Originally from Largo, Florida, Hanson is looking forward to learning new techniques and using hands-on methods to further hone her oyster aquaculture skills. “By the end of the program, I hope to gain knowledge, experience, and the confidence to complete all tasks required for oyster aquaculture,” says Hanson. 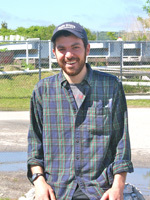 Coming to VIMS from Beverly, Massachusetts, LaChance gained experience in oyster aquaculture in New England while pursuing a Master’s degree from Brown University. LaChance says he hopes to understand more about the genetics and breeding of oysters, what makes a good oyster, and how to farm them. 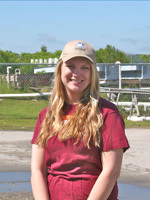 All four of the interns will be trained on all aspects of oyster aquaculture. The trainees are currently working on a variety of hands-on tasks in the hatchery, ranging from spawning adult oysters, to caring for oyster larvae and algal cultures, and even to maintaining pumps and filters. Once oyster spat develop fully, the trainees move on to the VIMS nursery and field sites where they will focus on the latter phases of the oyster lifecycle. In the nursery, they will learn the importance of density and water flow in VIMS’ upwelling systems. Once in the field, trainees will learn the importance of seawater flow rates, sieve and bag sizes, and oyster seed sizes and densities. They will also learn field grow-out methods, such as “rack and bag.” Trips to commercial facilities will acquaint the trainees with alternative grow-out methods.